No company-wide collaboration plan is complete without a clear strategy for how you will manage and monitor your collaborative environment. Do you have sufficient skilled resources in-house or will you need to rely on external vendor to ensure your investment is delivering the results you anticipated? In the MANAGE section of this site, we discuss the range of managed service offerings and delivery models available to support video conferencing and collaboration initiatives in the enterprise. Get started with the tech brief below. As IT leaders work to extend video conferencing access beyond conference rooms to a greater percentage of their workers, they increasingly need to rely on deployment and management solutions that will simplify the process. Managed services are intended to give IT leaders the resources required to deliver a consistent, positive audio and video conferencing experience to their end users. However, the wide range of descriptions and delivery models that are used by providers make it difficult to understand and evaluate available options. In the context of enterprise collaboration, managed services can simply mean hosted video conferencing or it can mean full-service management and monitoring including on-site services. There are four conferencing and collaboration related services that are commonly delivered through managed services: management and monitoring, video conferencing services, concierge services, and infrastructure. In this tech brief, we’ll describe evaluation considerations and delivery models for each service. 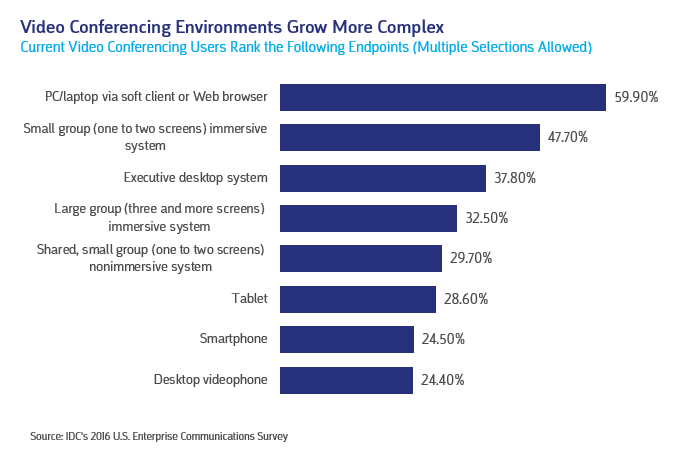 As video conferencing environments grow more complex with a mix of room-based and personal video solutions, it takes more resources to ensure systems function properly and users enjoy a high-quality, productive collaboration experience. According to an IDG and AVI-SPL survey, relieving the burden these types of demands place on IT teams as well as quickly resolving technical issues are two of the top benefits IT expects to gain by working with external vendors. Onsite managed services will place a skilled audiovisual and video collaboration technician at the customer site to manage and monitor video conferencing systems. Run the numbers on fully equipped huddle and conference rooms with managed services. Adding cloud-based video conferencing to the enterprise accomplishes two very important goals. First it makes video conferencing accessible to a much larger pool of employees who can now engage in impromptu video conferencing meetings—from any location, using any device. Second, it allows IT to enhance the capabilities of legacy room-based video conferencing systems, making it possible to connect meeting room video to a Skype for Business meeting. There are also financial and productivity benefits to be gained when transitioning to cloud-based video conferencing. To learn more, read Collaboration Solutions in a Cloud-Centric World. In addition to video conferencing, managed service providers (MSPs) may offer cloud recording and streaming options for calls and meetings. These options work with standards-based video conferencing endpoints and virtual meetings rooms and enable playback and live streaming on any device. Cloud-based video conferencing should have multiple deployment options to choose from. Most common are public cloud (as a service), hosted private cloud, private on-premises, and a hybrid option. To learn more about which deployment models are available to you, watch this short video. Pre-call testing to ensure any connection issues are taken care of prior to the meeting. Real-time monitoring to see who is on the call or who might have audio or video issues that need to be addressed. Call hosting and Q&A handling to ensure calls start on time and provide monitoring and assistance with interactions during the call. One-point of contact who handles your meeting from start to finish and who makes sure thing run smoothly. Concierge services are most often provided remotely, however some MSPs do offer on-site concierge assistance. For IT leaders willing to transition infrastructure components to the cloud, managed services for video conferencing offers a hosted infrastructure option for gateway, registration, and call control. Infrastructure services can often be provided through both public and private cloud options as well as on premise. AVI-SPL Managed Services make it easy to extend video conferencing capabilities throughout your organization and create high-quality video collaboration experiences for your employees. Learn more about our cloud video conferencing, concierge conferencing, infrastructure, and monitoring and management options. Call 866-559-8197 to discuss your needs with our managed services team. Want more information about creating effective collaboration environments? Read "How to Unify Your Multi-Vendor Collaboration Environment." This white paper explains how to better integrate existing video conferencing systems with new tools like Skype for Business. Complete the form to access the white paper. Nearly two thirds of the IT organizations surveyed are either using or planning to use public cloud IaaS by the end of 2016. Relieving the burden on IT teams and quickly resolving technical issues are two of the top benefits IT expects to gain by working with external vendors.